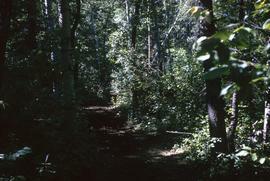 This slide is of the trail to camp out at Camp Arnes. 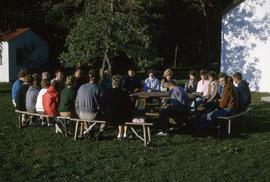 This slide is of morning prayers at Camp Arnes. 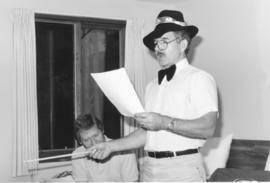 This is a photograph of a Alvin Enns, who is wearing a funny hat and appears to be rehearsing a play or skit. John Martens is seated to the left. This slide is of a man (John?) 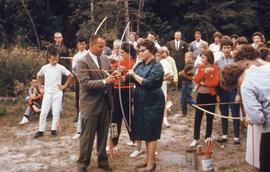 instructing an archery activity to a large group of people at Camp Arnes. 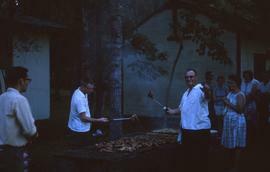 This slide is of a Chicken BBQ at Camp Arnes Family Camp. This slide is of a baby (Loewen?) 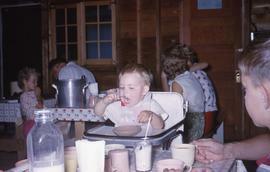 eating in a high chair at Camp Arnes. 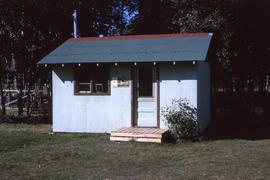 This slide is of the boathouse at Camp Arnes. 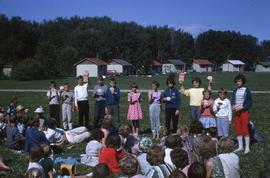 This slide is of the campers who won the "Best Camper" awards at Camp Arnes. 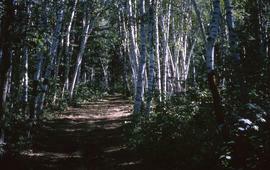 This slide is of a path through the birch trees at Camp Arnes.